Boating and flying are very popular activities within Second Life. There are many beautifully landscaped sims to spend a leisurely afternoon of exploring by boat or yacht. So I thought I would get in on the action! Well I ran my boat aground causing other residents to scamper out of the way with one resident yelling,..run for you life…a noob sailor!!! Feeling like the noob, he just broadcasted about, you do have to admit I look great, although in distress, in L E N N I E Layra Crochet Dress! Vintage inspired, white, open knitted, crochet mini dress makes being embarrassed look good! This dress features a floral crochet print, a sleeveless tent silhouette and a jeweled neckline. I look cool and summer sophisticated, in L E N N I E Layra Crochet Dress for Sneak Peek! Oh gosh..Did I do that!!! Watch out Second life boaters!!!! 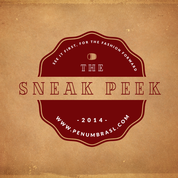 Sneak Peek gives you the inside scoop on trends and the latest happenings in the virtual world of fashion. It is an exclusive, monthly, fashion and creativity event that will put YOU, on the fashion forefront and in the know! Come and shop the latest Summer Wear this season and don’t forget to grab the free June Gift Bags from our designers! Sneak Peeks ends July 5th. RAPTURE, Pizzazz Haute Couture, Ashmoot, WTB, BN designs, LaVian & Co.